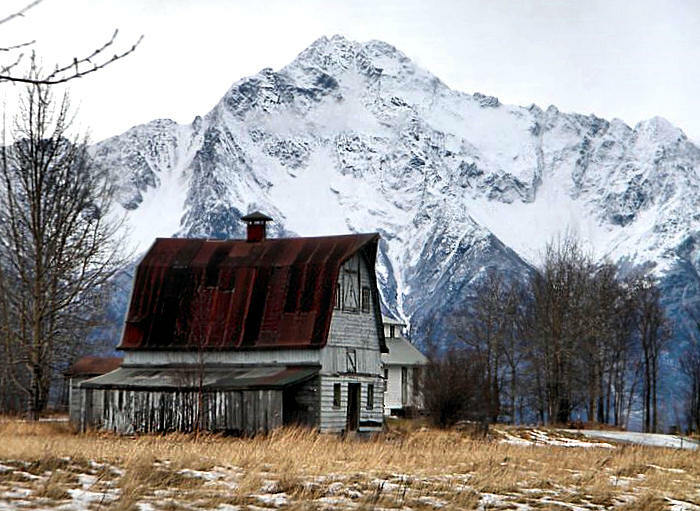 Lauren Maxwell of KTVA Channel 11 News contacted me a week or so ago about doing a news feature on the barns and my book. So yesterday I met her and her cameraman, John Thain, in Palmer, and we did some filming and interviews for a short clip segment which will be airing at 6 and 10 pm tomorrow (Thursday, June 13), and will be available to view on their website anytime. UPDATE: The video clip is available at this link. Our first stop was to see my friend Barbara Hecker, who shared her grandfather’s old Colony barn, now owned by Dr. and Mrs. Vaughn Gardener. 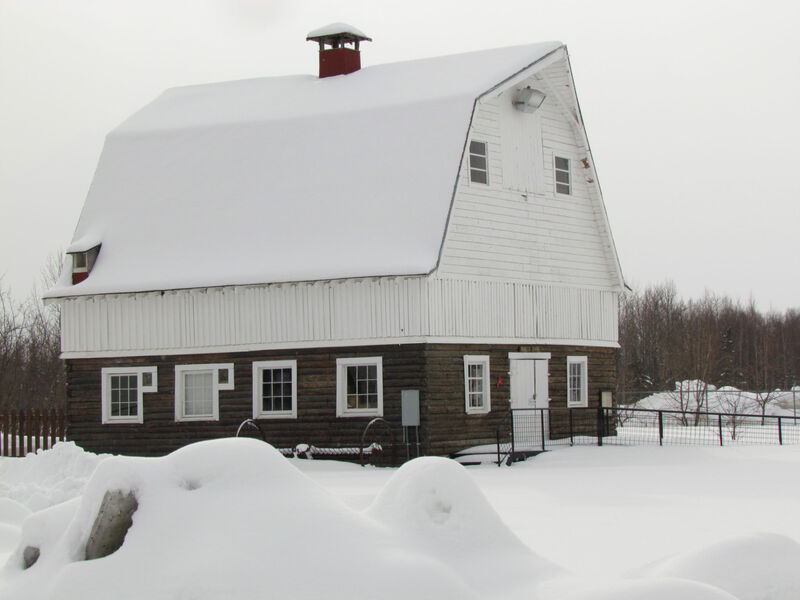 Originally built for the Earl Barry family in 1936, this barn was purchased by Barbara’s grandparents, Earl and Kathreen Hecker, in the early 1940’s, when the Barry family left the Colony Project and purchased the Bogard homestead on Finger Lake. 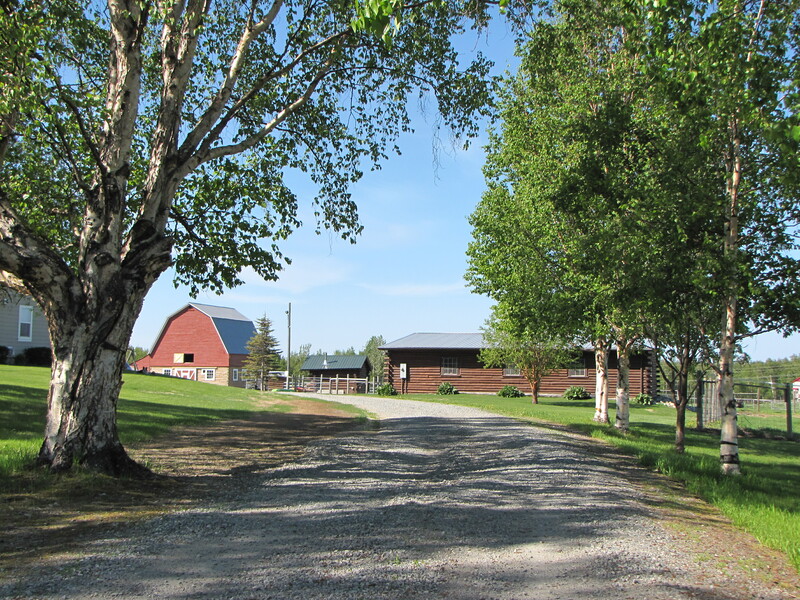 In 1948 Barbara’s parents, William and Bergie Hecker, took over the farm and turned it into a Grade A dairy. 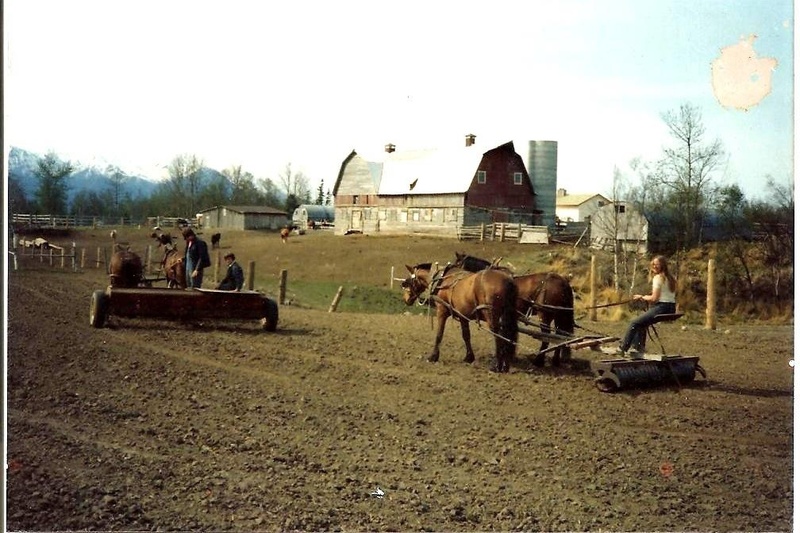 The Gardeners purchased the farm from Barbara’s parents in 1989, and in 2012 they renovated the barn, revealing the original logs. 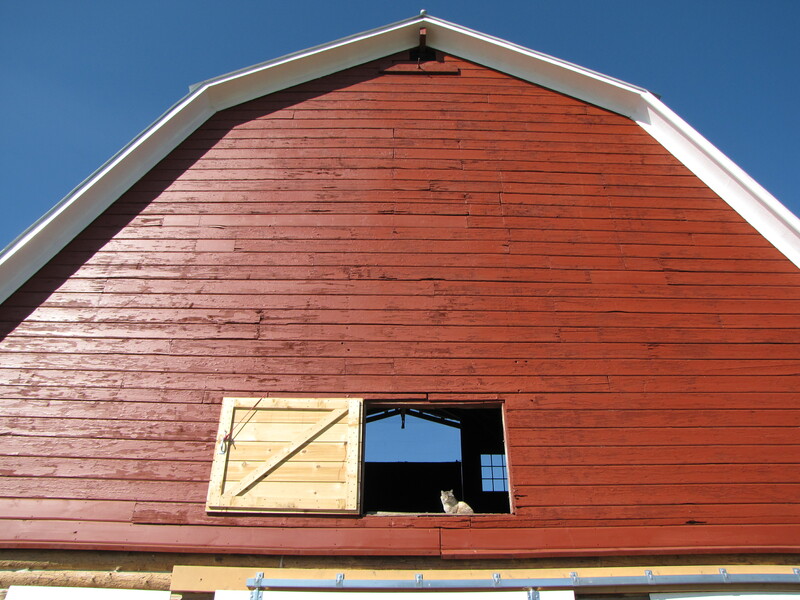 They straightened and strengthened the walls, added a new steel roof, painted the whole barn and added classic red and white barn doors. 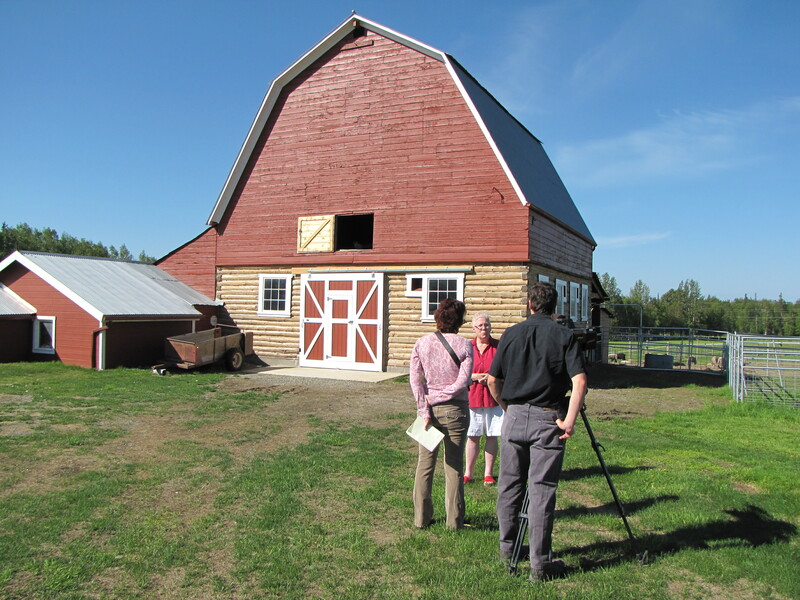 It was interesting to visit the old barn and listen as Lauren interviewed Barbara about her family’s history. A barn cat appeared in the haymow, sunning herself, while the Gardener’s border collie, Daisy, earnestly tried to direct our attention to the ball she loves chasing. Barbara talked about the newly-revealed logs with their tiny bug tracks, showed us the milking parlor addition and explained how her father’s cows would enter in the proper order, each cow moving to their own milking station, and when the milking was completed they would back out of the stanchion and return to the pasture, somehow knowing just what to do and when to do it. We talked about the growth and development which has happened since Barbara’s parents and grandparents farmed the land, and Lauren asked Barbara if it was hard to live close by, seeing her family’s barn every day, and watching the changes happen, such as the nearby subdivisions. Barbara explained that the life of a dairy farmer was never easy, and sale of the land brought a welcome influx of cash to her family. She philosophically considered it just part of the natural progression, and said there were benefits to having things easier, even if it meant having a motorhome parked in the middle of her awesome view of Pioneer Peak. 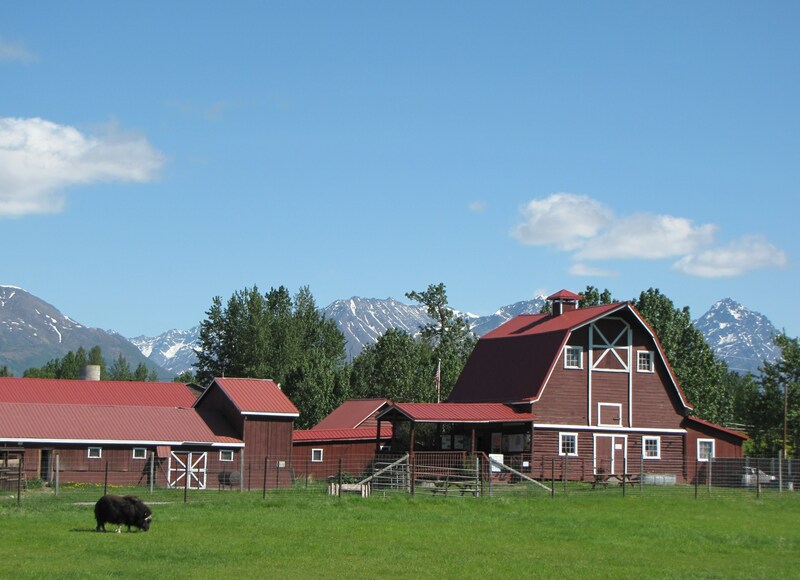 Our next stop was the Musk Ox Farm, where the barn originally built for the William Lentz family is now the Farm’s gift shop and museum. A long low building next to the barn was probably the milking parlor when it became a dairy in the 1940’s. Executive Director Mark Austin shared some interesting facts about these Ice Age mammals. After a brief interview with him, we walked a trail between the pastures to a good vantage point for filming the barn and Lauren did a short interview with me about my reasons for writing the book and what I enjoyed about the process. My easy answer was that it was the people I’ve met while researching the barns. 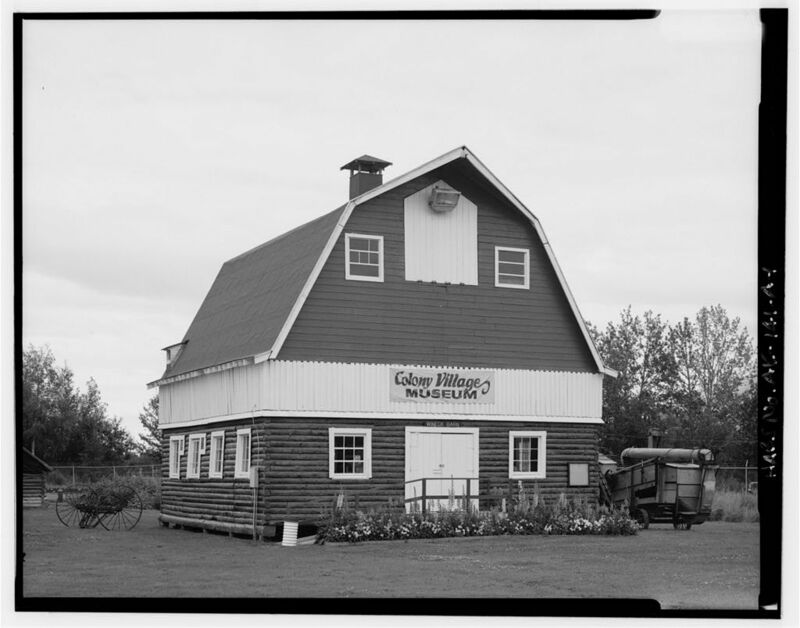 While my original thought was to make this merely a picture book showing the beauty of these old structures, it very quickly became apparent to me that the history of the 1935 Colony Project was such an intrinsic part of the barns that it needed to also be part of my book. So what had begun as a photographic journey turned into a research project, and that led me to dozens of people who have since become good friends. 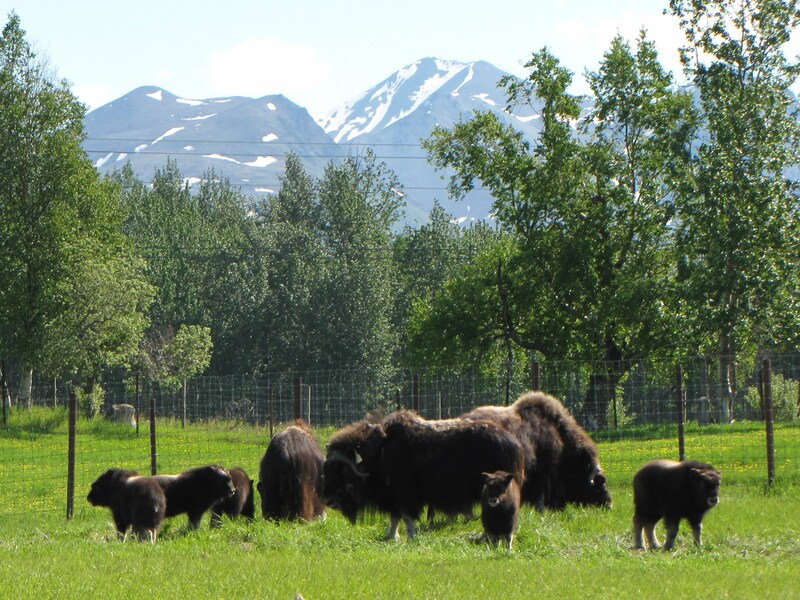 Mark pointed out that there were seven new baby Musk Oxen this year, and we enjoyed watching them frolic amongst their mamas in the adjacent field. We found tufts of qiviut, the fine wool shed by the musk oxen in the spring, and marveled at the silky softness of it. 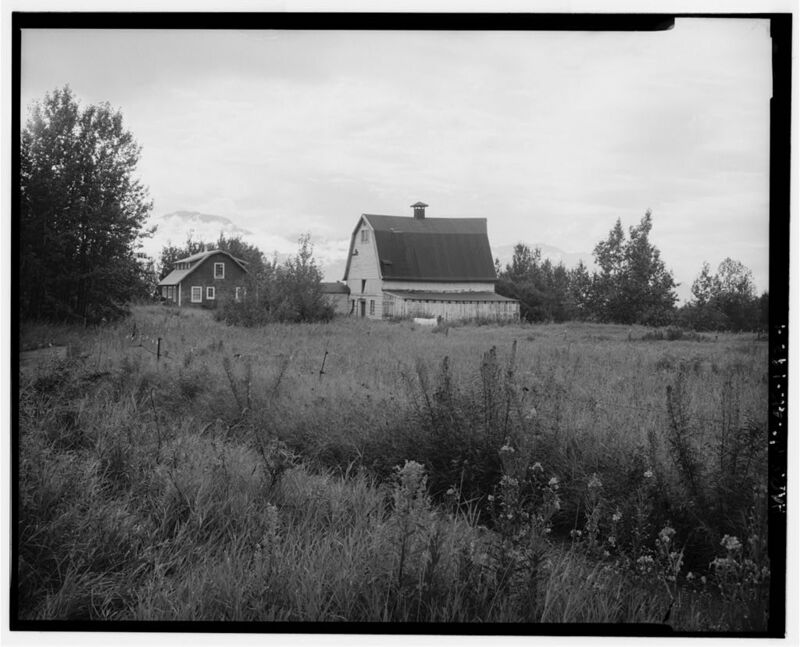 We talked about the history of the Colony Project, and how the barns played into that history, and I explained that there were two Lentz families in the Colony; William’s brother Joe also had a dairy, in the Bodenburg Butte area. 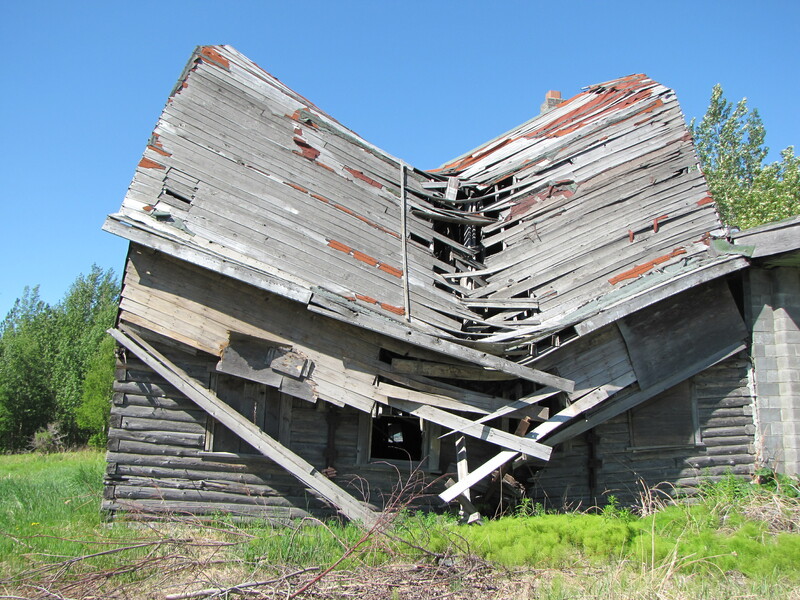 Our final stop was the original Lloyd Bell barn, later owned by Doc McKinley, but now slowly collapsing into itself. We spent a fascinating hour or so listening to stories by the current owner, Pegge McDonald. She told us Doc McKinley was a dentist, known as the Flying Doctor, and she’d been in Cordova when he would fly into town, set up his equipment, and do exams and work on all the children in town. And then she saw him do the same thing one time in Nome… She told us about his wife, who didn’t want her cows to be cold in the wintertime, so a basement was dug under the barn, and a fireplace built so the cows could be kept warm when they temperatures dipped. The huge cement block chimney can still be seen rising through the roof of the great structure. 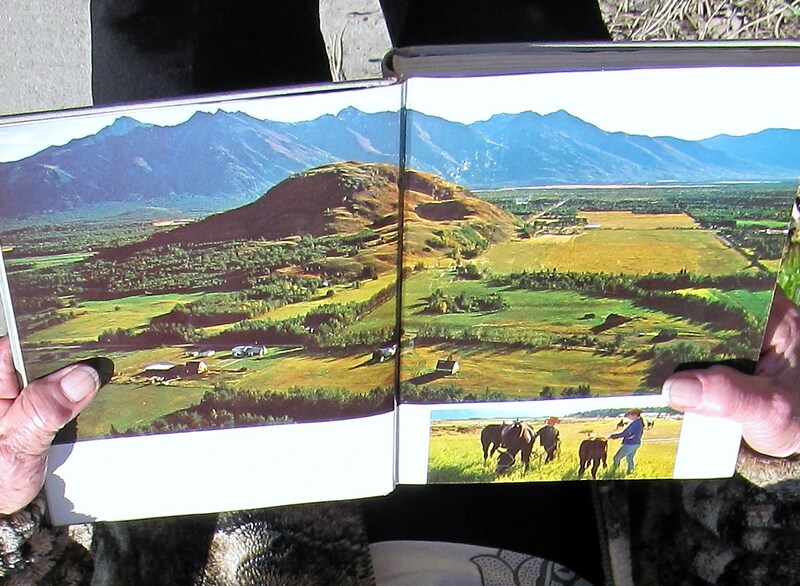 Pegge brought out a book and shared it with us, a 1960’s National Geographic hardback titled ‘Alaska,’ which featured a two-page aerial photograph of her farm, with the barn standing proudly upright. She told us Doc McKinley would hold dances for the local teenagers in his huge living room, and explained that he had the tremendous rock fireplace built of rocks hauled by local teenage boys who were courting his daughters, while the construction was done by a European stonemason boarding with him. We enjoyed listening to Pegge’s tales, and assured we’d be returning to hear more sometime. Another barn’s history discovered, and another new friend.